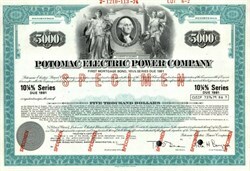 Beautifully engraved specimen certificate from the Potomac Electric Power Company printed in 1974. 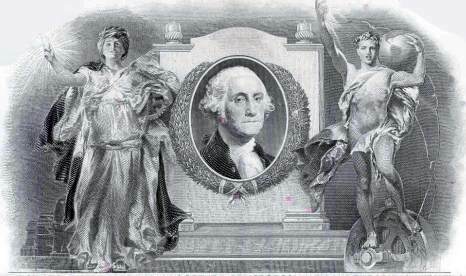 This historic document was printed by the American Banknote Company and has an ornate border around it with a vignette of two allegorical people standing beside a portrait of George Washington. This item has the printed signatures of the Company's President and Secretary and is over 41 years old. Pepco Holdings, Inc. is a diversified energy company with headquarters in Washington, D.C. Its principal operations consist of Pepco and Conectiv Power Delivery, which deliver 50,000 gigawatt-hours of power to more than 1.8 million customers in Washington, Delaware, Maryland, New Jersey and Virginia. PHI engages in regulated utility operations by delivering electricity and natural gas, and provides competitive energy and energy products and services to residential and commercial customers.